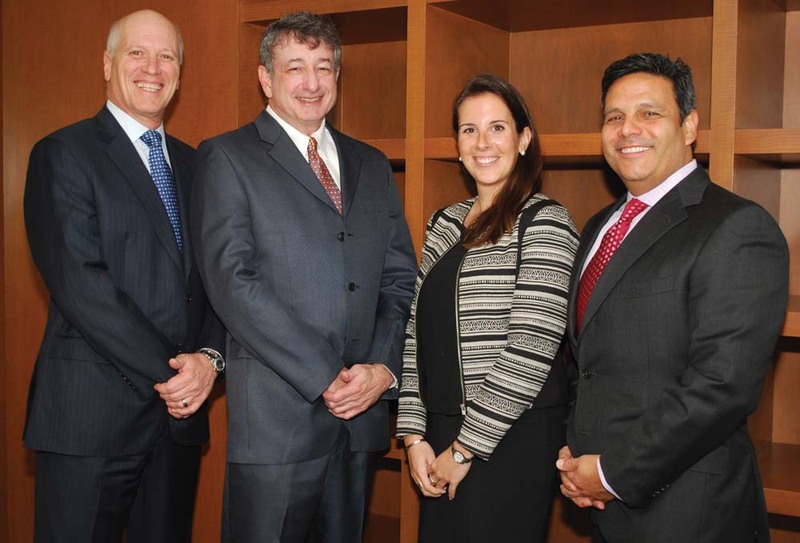 Robert Targ, Gary Davidson, Marta Colomar and Michael Diaz, Jr.
A decade ago, Diaz, Reus & Targ LLP was a small Miami firm with big ambitions, striving to serve U.S. and Latin American clients in commercial litigation, white-collar criminal matters and major business transactions. Under the visionary leadership of Michael Diaz, Jr., global managing partner, Diaz Reus has far surpassed its initial goals to become a full-service international law firm with 14 offices in the U.S, Latin America, the Middle East, Asia, and Europe – and more on the way. From an initial group of six Miami attorneys, Diaz Reus now has nearly 50 attorneys worldwide, including 15 in its downtown office. “We have built a great team of multilingual, multicultural attorneys who know how to resolve disputes, structure financial and business transactions, and protect our clients’ interests,” says Diaz. Along with helping clients structure multinational transactions and avoid international compliance and regulatory challenges, the Diaz Reus attorneys handle complex litigation and arbitration cases, as well as white-collar civil and criminal cases, including international investigative and asset-tracing services. From counseling banks on anti-money laundering (AML) compliance to facilitating trade between Latin America and Asia to representing high-profile individuals and companies in court, Diaz Reus’ attorneys handle a wide range of international matters. Now, Targ represents individuals and institutions that are under investigation or facing criminal charges in money laundering, fraud, tax fraud, customs or other white-collar criminal cases. Like Diaz, Targ is a certified AML specialist who consults frequently with financial institutions in Latin America, the U.S. and Europe, assessing risks and helping them develop compliance policies and procedures. In November, Dias Reus partner Marta Colomar joined Targ in giving a presentation at an anti-money laundering conference in Madrid. “My practice includes financial matters, including commercial litigation and arbitration,” says Colomar, who is a regular contributor to CNN Español and Inter-American Dialogue’s Latin America Advisor on international finance, banking, and money laundering. Another partner, Gary E. Davidson, is an experienced litigator and arbitrator serving a global client base. “Since I joined the firm in 2007, we have more than doubled the number of attorneys in Miami, adding to our capabilities to serve the region,” he says. A member of the Multi-Million Dollar Advocates Forum, Davidson was lead counsel in a $3.8 million arbitration against a South American airline that violated its charter agreement, and preserved the rights of the Honduran national soccer team to negotiate multimillion-dollar television contracts on its own behalf. He also gained a significant fraudulent transfer judgment for a prominent Colombian company following a 10-day trial. Diaz himself is a litigator, trial lawyer, and arbiter, who also counsels clients on commercial and financial opportunities. He started his legal career as a prosecutor for the State Attorney’s Office, and financial fraud, international asset recoveries, and white-collar criminal matters continue to be a significant part of his practice. He has investigated and defended clients in high-profile cases involving FIFA (the soccer regulatory authority), as well as the Ponzi schemes involving Bernie Madoff and Allen Stanford. Diaz has served as special counsel on behalf of U.S. receivers, financial institutions, and individual victims of financial fraud. “Our firm’s sophisticated asset recovery techniques have allows us to recover millions of dollars of stolen proceeds for our clients,” he says. As a Miami-based international law firm, Diaz Reus has served high-profile clients in Latin America since its founding. “When something goes wrong in the region, we are often engaged to handle civil or criminal matters,” says Diaz. In recent years, the firm has helped Petróleos Mexicanos (Pemex) resolve nearly $160 million in a global bribery case, and represented the interests of Argentine sovereign bondholders in a class action case in New York. The firm’s investigative team also helped resolve a “cold case, ” collecting a Venezuelan trading company’s 20-year-old $10 million credit facility from FOGADE, the Venezuelan equivalent of the U.S. Federal Deposit and Insurance Corp.
For the past four years, Latinvex has ranked Diaz Reus among Latin America’s “Top 50 International Law Firms.” The firm has eight offices in the region, and plans to open a new office in the Dominican Republic early in 2016. “Our firm is actively engaged in Latin American transactional work, as well as litigation and arbitration,” says Diaz. Along with growing its presence in Latin America, Diaz Reus continues to expand in other parts of the world. In November, the firm opened its newest office in Santa Monica, California. Partner Chad Purdie, who joined the firm in 2006 as a law clerk, now leads the Los Angeles-based practice, with a focus on international business matters and sports and entertainment law. “We’ve had great success representing athletes and entertainers,” says Purdie. Diaz Reus also recently established a strategic alliance with the Australian firm Holman Webb Lawyers to strengthen its capabilities in the Asia Pacific region. “Our next step may be to open a Diaz Reus office in Sydney, to serve our U.S. and Latin American clients seeking business opportunities in Australia,” Diaz says. In the next five years, Diaz Reus’ strategic plan calls for opening several more offices and growing to 60 to 75 lawyers worldwide. “We don’t want to be the biggest international firm on the block – just the best,” says Diaz.